If you are a physicians office in the islands of Guam, the CNMI (Saipan, Rota, Tinian), the Federated States of Micronesia, or Palau, and are looking to order affordably priced tamper prescription (Rx) pads, the Gerard Aflague Collection can help you. 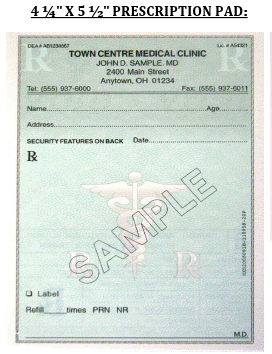 With new laws governing the dispensing of prescription medications especially for controlled substances, and for programs under the Medicaid program, many medical offices need to comply with many state and federal laws that require these pads to be manufactured with minimum tamper-resistant characteristics from an approved printer. While you may be able to source tamper-proof, Medicaid compliant prescription pads on island, you may be paying too much for them. One medical group ordering from our company has said that they were paying almost three-times when they ordered from a vendor on Guam. This may even be higher for other islands outside of Guam. If you are a physicians offices needing affordable tamper-proof prescription pads, please contact the Gerard Aflague Collection today to get a quote by filling out the online custom quote request form. The Gerard Aflague Collection is a mainland broker of printing services that assists to obtain your Rx compliant pads. We assist to place the order, inspects them, and package them in water-proof plastic, before sending them via USPS Priority mail to your physician’s address. Your product will be trackable, insured, and sent within 5-10 days after we have packaged them for remittance. 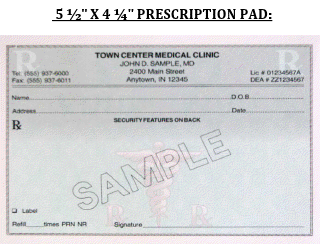 Rx pads are customizable with numbering, additional prescriber, name and addresses, etc. Order one or two-part (carbon) tamper resistant physician prescription pads that are Medicaid compliant, customized for your medical practice. Note: Physicians offices will be required to provide the physician’s DEA license number which will be verified and checked prior to the order being placed and printed. We will only ship orders directly to the physician’s office or medical group address after verifying that this is in fact accurate. 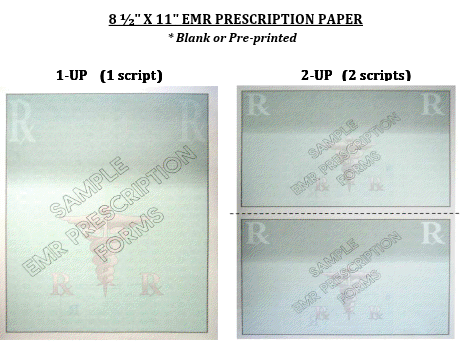 We also can source EMR Prescription paper with these same security features for your physician office’s needs. Do you need the best priced and most affordable printing for your products destined for Guam, the CNMI, the FSM, and Palau? Many customers in the islands who seek high-quality four-color offset printing, digital printing, specialty printing, and large format printing have come to understand that it is generally expensive to obtain printing services on island among the few printers that service the islands, when compared with printing companies off-island. In one example, a customer found that printing was almost three times more than what was available in the mainland United States. In another example it was ten times cheaper in Asia. This is one reason why folks seek competitive quotes elsewhere. While one can get printing services in Asia, including the Philippines and Hong Kong as examples, many will find that the quality may be sub-standard (i.e. Philippines) while the expense to ship it back to the islands may make the effort a wash, or even cost more in the end because of higher international DHL and FedEx shipping rates (i.e. Hong Kong or Korea), not to mention the customs fees and taxes that one may need to pay upon importing such goods into the islands (which can encompass an additional percentage of the cost of the goods, plus expensive overtime charges for goods that need to be cleared in an expedient manner, or outside of regular service hours). In some cases, others may choose to find a printer on-line from the United States mainland to ensure a greater potential for higher-quality and hopefully an easier to time to communicate with customer service staff, however, they quickly find that most mainland providers only ship via UPS and FedEx adding to the total cost of their printing needs with Use Tax again as an added potential cost – which may add to the delay of getting your products. For the small percentage that ship via the post office, customs forms are an added hurdle that they don’t care to maneuver. In spite of all these challenges, don’t despair. Whether you start-up business in the islands needing marketing material, an established company needing 10,000 brochures, or an individual in need of a set of business cards or a single banner, there is a better option! The Gerard Aflague Collection (based in Colorado) offers custom design and printing services of all kinds. What are the advantages? Well for one, the company knows the islands because they are from the islands, they understand that sending packages via the US Postal Service is the most economical and value based method, and more importantly, they work with many large, and experienced mega-printing companies to bring you what you need at a value that almost always would beat any competitor’s price in the islands. They understand Use Tax laws and know that for shipments arriving into Guam, if the US Postal Service is used, it requires a customs form and it will not necessitate taxation at the border, nor would there be additional overtime for clearance services. Additionally, they are able to offer value-based tracking, and ensure that it is packed in a water-tight manner to ensure that they goods do not sustain additional damage as it makes its way onto the island by plane, boat, or other means. Because they work with multiple printing companies across the nation, they pass along high-quality products and value-based pricing. If you need affordable and competitive printing for your business or personal needs and want it shipped to Guam, Saipan, Rota, Tinian, the FSM, or Palau, simply fill out the online form of the Gerard Aflague Collection and let us know exactly what you need. We’ve put together frequently-asked-questions about obtaining affordable printing to Guam, the CNMI (Saipan, Rota, and Tinian), to the FSM (Chuuk, Ponphei, Yap, and Kosrae), and to Palau. Read on. 1. What types of printing services do you offer? We offer digital and/or 4-color offset business cards, postcards, mailing labels, stickers, pamphlets, posters, door hangers, plastic cards, Giclee prints, PVC cards, folders, table tents, magnets, envelopes, stationary, flyers, bookmarks, mugs, t-shirts, totes, canvas, and much more. On the large format category, we offer banners, floor adhesives, window tint, wall murals, and much more. 2. Do you offer specialty printing? Yes. We offer speciality printing including fine-art Giclee prints, shadow light-box transparencies, and print on curtains, table covers, photography backdrops, and over one-hundred other home and office products including. We also offer laser printing and etching on a variety of wood, metal, glass, stone, leather, and paper products. 3. Do you offer embroidery? Yes. We can assist with your embroidery needs that usually includes a digitizing fee for custom designs and the cost for the embroidery, plus the item in question. 4. Do you offer high-end printing on plaques? Yes. We offer the ability to plaque photos, as well as digital vector images for your personal as well as corporate needs. 5. How is it that you can offer a better product and value all-together? We pass on the discounts to you by leveraging mainland printing companies that provide the highest-quality products, and package your order for delivery using the most economical means, in many cases avoiding additional taxation upon entry into certain island jurisdictions. 6. How long does production and shipping to the islands take? Printing can take about 3-6 days depending on standard orders, with rush turn-arounds available. Shipping to the tropical isles (we only use US Post Office as our shipper) takes between 4-10 days depending on what is being sent (Priority Mail), with Express shipping offered (2-3 days) with tracking and insurance. 7. Who can submit and order a custom printing product? Government agencies, non-profit organizations, and for-profit companies, as well as individuals who need high-quality, value-based printing. 8. Do you drop ship orders? Yes. For example, if you live in Saipan, you can place the order and make payment, then we can drop ship your order to Tinian, Guam, or the FSM, with no additional shipping cost to you. 10. How do I get an estimate for my job? Click here and fill out the online form to request a custom quote for your printing needs. Our company will give you an estimate no later than the next business day. If you accept, we will assist you with proofs via email that you will approve, then we will commence the printing process. It’s that simple.